Before the charismatic John Duval Gluck, Jr. came along, letters from New York City children to Santa Claus were destroyed, unopened, by the U.S. Post Office. Gluck saw an opportunity, and created the Santa Claus Association. The effort delighted the public, and for 15 years money and gifts flowed to the only group authorized to answer Santa's mail. 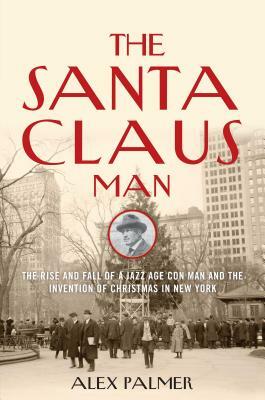 Gluck became a Jazz Age celebrity, rubbing shoulders with the era's movie stars and politicians, and even planned to erect a vast Santa Claus monument in the center of Manhattan -- until Gotham's crusading charity commissioner discovered some dark secrets in Santa's workshop. The rise and fall of the Santa Claus Association is a caper both heartwarming and hardboiled, involving stolen art, phony Boy Scouts, a kidnapping, pursuit by the FBI, a Coney Island bullfight, and above all, the thrills and dangers of a wild imagination. It's also the larger story of how Christmas became the extravagant holiday we celebrate today, from Santa's early beginnings in New York to the country's first citywide Christmas tree and Macy's first grand holiday parade. The Santa Claus Man is a holiday tale with a dark underbelly, and an essential read for lovers of Christmas stories, true crime, and New York City history. Alex Palmer is freelance writer and researcher who curated an exhibit on the Santa Claus Association for Brooklyn's City Reliquary in December 2012. It received wide press attention and was the subject of a major holiday feature for WNYC. He is the author of two previous books: Weird-o-Pedia (Skyhorse, 2012), for which he researched hundreds of unusual facts about everyday things from Donuts to Dogs and which has sold more than 10,000 copies to date, with special distribution in Urban Outfitters and elsewhere; and Literary Miscellany (Skyhorse, 2010), which offers a breezy and entertaining survey of the history of literature. His writing has appeared in the NY Daily News, USA Today, The New York Post, Publishers Weekly, and many other outlets. He lives in Brooklyn, New York.